The 24th annual Diet Meeting was held at the lecture hall of the House of Councilors Building at 3 pm on May 23rd (Thursday). The main speaker at this Diet Meeting was the mayor of Kawauchimura, Mayor Yuko Endo, and the format of this meeting was different from the others, as it included the reading of the bulletin and some time set aside for questions and discussions. There were approximately 60 participants at the Meeting. The Meeting started off with a brief but logical explanation from the acting director, Nobuhiro Shiotani, on the relationship that exists between Kawauchimura and SVCF as well as the shared goal that the village and the NGO have. Then, Kawauchimura’s Mayor Endo talked about the current condition of Kawauchimura as well as of the challenges that the village is facing. The talk lasted over an hour, but the Diet members, who rarely stay through an entire talk, all stayed until the end. (Please refer to the below information). The Diet members who participated, were as follows: Toshinao Nakagawa, Hiroshi Sakurai, Masatoshi Akimoto, Katsumasa Suzuki, and Tomoko Abe of the Lower House, and Kuniko Tanioka of the Upper House. What was most memorable was that after the talk was over, representatives Tanioka and Abe both said that they wouldn’t necessarily support sending children back to the village, but despite their different way of thinking, they were inspired by the mayor’s devotion and dedication in supporting the will of individuals wanting to stay in the village, as well as individuals wanting to return. Thank you for providing this fantastic opportunity today. I feel that with the passage of time, people are starting to forget about what happened on March 11th. The most worrisome thing for the affected areas is that this disaster will get forgotten, along with the individuals living in the affected areas. However, this accident is still ongoing. I would like everybody to remember that. Kawauchimura is one ofJapan’s few power supply zones, located in the eastern part ofFukushima prefecture, in Futaba-gun. However, the village is typical of one found in hilly, mountainous regions, both temperately and scenically. Everywhere you look, there are rice paddies, and people’s homes dot the undeveloped woodlands, with remote mountains in the background. Virgin landscapes still remain. Time passes slowly here, and it is our hometown that we love and find comfort in. For the farmers that live there, the agriculture, land, and nature have been passed on from generation to generation. The people that live there now want their children and grandchildren to inherit the buildings, land, and nature from them. That’s why they value the soil, protect the pristine streams that flow through the mountains and forests, and nurture these lands, which have given them so much bounty. This recent accident not only stole these peoples’ livelihood, but also the connection between the past and the future, their sole existence. 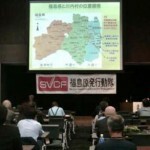 This may be hard to understand for people that only seeFukushimaprefecture as another business opportunity. If you ask, “have these people given up, then?” the answer is “no, they haven’t.” What these farmers who are in their 60s, no probably closer to their 70s, are doing, is that they’re clearing small rocks from the farms that have already been decontaminated, and getting the land ready for cropping. So they haven’t given up. They are trying to resolve this issue within their lifetime. For the past year, we’ve been working hard on behalf of these people. On January 31st of last year, we made a proclamation for people to return to the village. At the time, around 200 to 250 people were returning to the village. I’m sure they wanted the administrative functions restored as quickly as possible. On the other hand, a lot of elderly individuals were suffering from a variety of health problems from living in temporary housing. Temporary housing units are small and cramped, and people are unable to move around very much, and tend to gain weight. Their knees and hips start to ache. Some people have even died from these health problems. In Kawauchimura, where the population is approximately 3,000, around 30 to 40 people die each year. However, in the past year, this number went up to 70. In the past year, I’ve come to understand how difficult it is for people to return to their own villages. The ghost towns are now overgrown with Canadian goldenrod and Japanese silver grass. The main purpose of the declaration was to restore administrative function. What’s going on with the village? What do we need to do to resolve the problems we face? How do we overcome the hurdles that are preventing people from returning to our village? We are at the forefront, trying to restore administrative function and collect as much information as we can as we deal with the situation. We wanted the residents to understand how strongly we want people to return. Sadly enough, I think our village will not be able to go back to the former conditions, as those before 3.11. It is not possible to deactivate the radiation dose completely. Otherwise, we should start rebuilding a new village, a new local community. We are planning to establish a new village with an image of the new Kawauchimura matching with the era of 5 or 10 years from now. 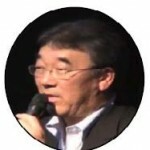 Keywords are “Choice”, “Judgment” and “Self-reliance”. I think that individuals should make their choice, considering the risks involved. The driving power is certainly restoration and self-reliance. The amount of compensation was fixed and presented recently. Active people say that they are going to start a new life in a new place while keeping the compensation in mind. I think that it is obviously natural. I am not insisting on coming back to the village denying such a natural idea. We are determined to require the compensation. At the same time, I think that it is more important to make a new proposal to make a living, not relying to the compensation. Our first work was to review and readjust the contaminated areas in the village. The old caution zone has been realigned as two, that is, habitation restricted and evacuation order releasing preparatory areas. The residents’ feeling becomes complicated by any means because of the separate zoning in the same village. One line divides the village. The amount of the compensation for damage differs so much depending on the zone. I got various feelings through engaging in decontamination work. The dose rate restriction of 1 mSv (millisievert) per year is very difficult to achieve. Among the households, 30 to 40% are not able to achieve this goal. However, the government of Japan does not indicate the direction for the future. In addition, whether we should decontaminate the forest which occupies 87% of the village or not, the Ministry of Environment does not even show the direction yet. Furthermore, the issue of temporary storage of the contaminated soil is not resolved yet. The head of Futaba-gun has prepared for the worst case. He has been making decisions as if he stood on the cliff edge every day. A new support system is required. Kawauchimura is about to come back now. The administrative duty, I think, is to show as much material and evidence as possible to consider for the return. Decontamination, preparation for the work environment, and provision of sufficient medical and educational environment should be provided. Examining such judging materials, some people may think that they cannot return yet, and others may come back. A new institutional design for those who come back is required. We cannot count on the moral of the evacuee to settle the issue. A new system for social and living support may be required when they come back. Our administration is two sided now. We support those who may not return as well as those who may come back. We got bashed when we declared to return to the village and when we had the town office service return as well. One year has passed since then, and I think, as a whole, that our decision was correct. We have received so much support from various people till now. To meet the expectation of those people, I think, it is important to prepare a firm environment of return for the restoration of the village. 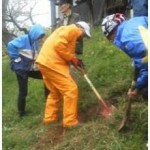 On May 11, 2013, some SVCF volunteers performed decontamination in a children’s orphanage “Fukushima Ai-iku En” (Mr. Hisao Saito, principal) located in the suburb of Fukushimacity. In the facility, 78 children from 3 to 17 years old live in 8 houses built on a large sloping ground, approximately 1.4 times larger than Korakuen baseball stadium. Though the premises were already decontaminated officially, passed-over hot spots and re-tainted spots after the initial decontamination were seen here and there. Consequently, children are strictly restricted for going outdoors. We were requested through Mr. Yudai Oouchi, Fukushima councilman, to scrape, bag, and move contaminated soil to a temporary storage prepared within the facility. Quite unfortunately, the weather forecast was cloudy that day, so decontamination was postponed. Instead, Shiotani, Shinoda, and Ando went anyway and planned a schedule for monitoring activities feasible in the rain and joined a 7-member volunteer group from Kita Ibaraki “Society to consider children’s health in orphanages of Fukushima prefecture”. As the rain luckily started late, at 14:00 p.m, we could at any rate finish our assigned work from 09:00 a.m.to 14:30 p.m. According to the monitoring data gathered and compiled by the facility, there were 12 spots that radiated over 2 mSv (microSievert) per hour. In a particular spot, a fabulously high radiation of 34.8 mSv was recorded. The actual work consisted of digging up contaminated soil. In a spot with extremely radiation we peeled off a blacktop surface, removed dirty soil, and piled up bags stuffed with clean soil. This was really quite heavy manual labor. The 7 tough guys from Ibaraki worked best. As a result of our collective efforts, radiation levels of the 12 targeted spots could be lowered to the 0.41 to 1.93 mSv per hour range.